Wanted to give a quick update concerning what some of the latest computer model runs are showing. I was able to run in to the station and grab off a couple of "cleaner" images of what the high resolution 4km RPM is suggesting for Sunday's weather in the Midwest. First of all, the Storm Prediction Center is still indicating there is a threat for severe weather across much of the Midwest Wednesday. Here is the latest outlook from the SPC. 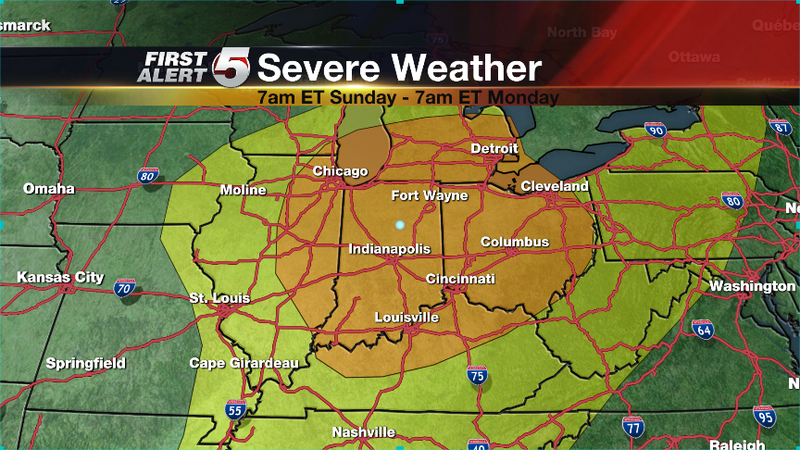 Orange indicates a "Moderate Risk". 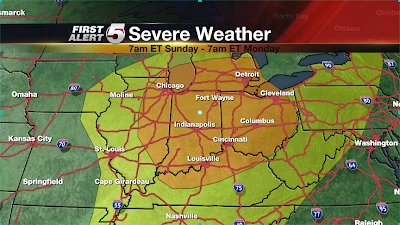 Yellow indicates a "Slight Risk". As you can see from the map above, many large metropolitan areas are included in the "Moderate Risk". The next couple images are going to be from the afternoon (18z) run of the RPM computer model. What you are seeing is what the model is predicting the radar will look like along with satellite imagery. The time on the graphic is shown in Mountain Time. Add two hours for Eastern and one hour for Central. As I mentioned in my previous blog post, there will likely be a few showers and thunderstorms developing overnight tonight in southeast Missouri, southern Illinois and southern Indiana. The above image is for 2am MT or 4am ET. Notice it does have a cluster of strong thunderstorms over southern Indiana. 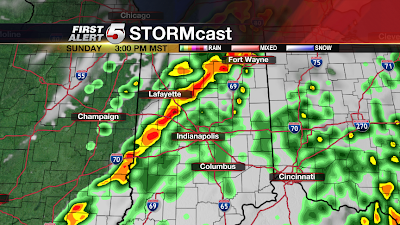 This could produce heavy downpours, frequent lightning and gusty winds. 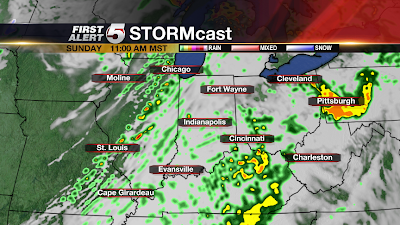 Next, we are looking at 11am MT or 1pm ET. 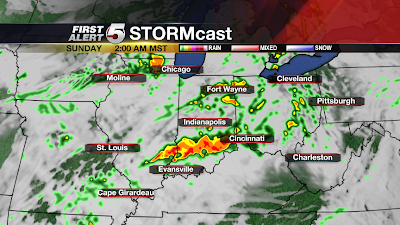 You can see that the model suggests the cluster of storms in Indiana have moved off to the east/southeast. But now turn your attention back to the west from northern Illinois through the St. Louis metro and down through southern Missouri. This is the list of storms I think will eventually become the "main show" for Sunday. Initially the model suggests the line will get started with individual cells before eventually coming together as a line. 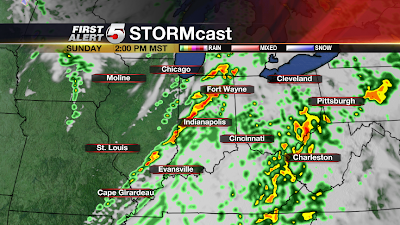 Now we are looking at 2pm MT or 4pm ET. Notice the line is maturing and moving east going from southern Michigan through western Indiana through southern Illinois to southeast Missouri. As I expected, the highest energy for the overall system will be a little further north. Notice how much more organized the storms look in north central/west central Indiana versus southern Illinois and southeast Missouri. Here is a closer look at central Indiana. 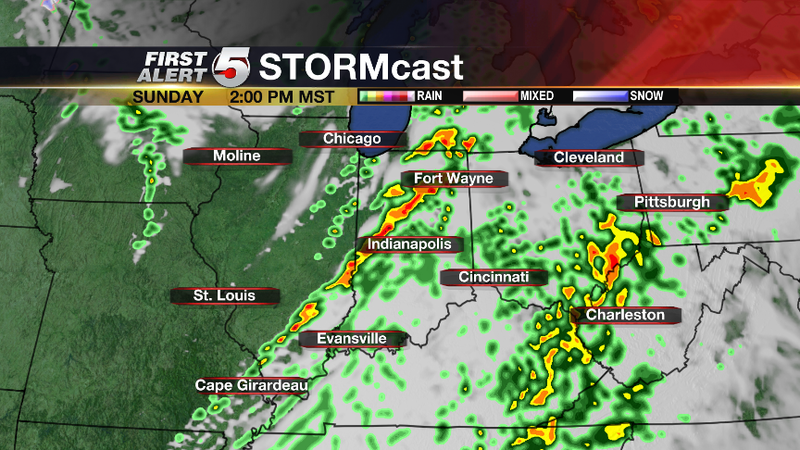 While the time stamp says 3pm MT it is actually 2pm MT or 4pm ET (my mistake). At this point the storms are just west of Fort Wayne and moving through Lafayette and Terre Haute. 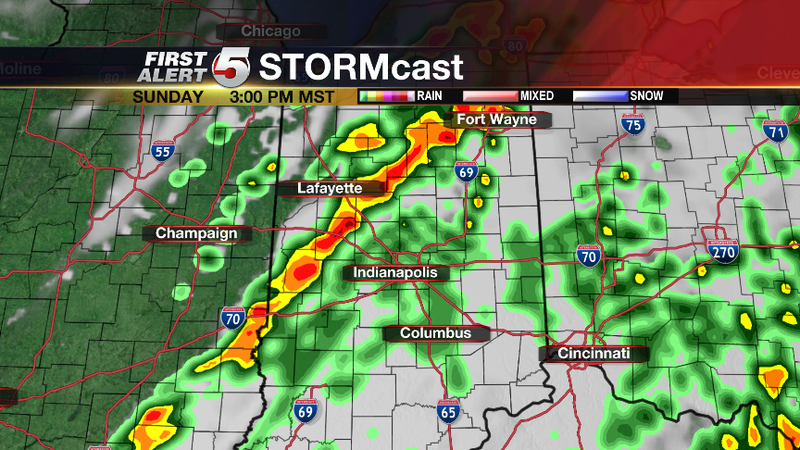 I still think a 5pm-8pm time frame is looking realistic for the Indianapolis metro area. As for other timings, check out my previous blog. I am in the process of uploading a couple of animated videos that will give you a better idea of what to expect from the RPM for tomorrow. Also, my Freak-Out-Meter stays the same as I posted in my previous blog post.